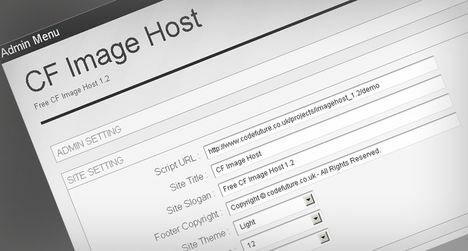 CF Image Host is a free, simple and easy to use PHP Image hosting script, which aims to make it easy to setup and maintain a photo/image hosting/sharing site. With thumbnails and social bookmarking links generated for each image, sharing your images or photos across the web couldn't be made any easier. CF Image Host is one of the popular free source of Image hosting script. Script with cool layout and designs is the major part of CF Image hosting script. They are regularly updating new versions of CF Image script with many new features. - Supports JPG, JPEG, PNG, BMP, GIF and PSD images. - Validation of uploaded files by extension and mime type. - Image delete urls for user on image upload. - Resize Image on upload.